Eeek – we are thrilled to present our very first personal money snapshot! By way of background: we got a few requests from readers to launch our own “money diary” series, so we asked willing readers to fill out a form with lots of details about debt, spending, saving and more! If you’d like to fill out the form and be considered for a future personal money snapshot, please click here if you’d like to see the form and/or submit responses! You can also see a PDF of the questions if you want to review them ahead of time. Aggressively paying down $15,000 in consumer debt (credit card) accrued due to a job loss, a period of underemployment after a relocation to a much lower cost of living area (from D.C. to Chapel Hill), and shopping like an idiot. I have about $2,000 left on my student loans, which was only $10,000 to start. I made educational choices that left me with as little debt as possible (full scholarships to both undergrad and law school, albeit to lower ranked, less challenging institutions than I could have succeeded in). I always had two jobs during school (except for during 1L). Parents generously paid my rent and let me drive a family car. We rent because we moved here with very little in savings and have lower-paying jobs. We sold our home to move to D.C., which subsequently ate our money ($2,500/month in rent for a 1-bedroom in Maryland), and now we rent for both money reasons and for flexibility reasons. We are planning to purchase again in 2019, thankfully, as we build savings and have a better grasp on what we want from our home. Have you ever done anything noteworthy to avoid or lessen debt? We had to cash out a small retirement account when my husband lost his job in 2013. We used it as a stopgap for some major things, but ultimately he re-invested about $4,000 of that. I invest about 15–20% of my gross pay each month (target date retirement funds), with some of that as an employer match. Higher ed has its minimal benefits for things like matching! We fund an emergency account for about $400/month, a down payment account at about $1000–$1500/month, and a vacation fund at $100/month. Buying a house is first priority, and a not-sucky retirement is the other. We are childfree and find that impacts some of our decisions with relationship to both the house and retirement. We just don’t buy a lot of stuff, clothes, disposable things. We’re relatively minimal with our “stuff” consumption. And we bring lunches! Twenty bucks? Idk, I’m a millennial. How much do you have in cash that’s available in a week, such as with an online savings account? $20,000, all of my banking is online, no brick and mortar (includes $7,000 emergency fund). When was your wedding and how much did it cost? 2010, $30,000 total (parents paid), $250 for my wedding ring, about $300 for bridesmaids’ gifts, $250 for husband’s gift. Was married at 24 to my high school sweetheart (still am!). Tradition in my family is parents pay; it is “their party in our honor,” and the guest list was big (175+) due to very large families. Did not get married in a church. Married by judge I interned for, on lawn of beach club in New England. No honeymoon, as we had just started jobs. Are there any other large expenses in your life, now or previously? Husband doesn’t do the taxes anymore… didn’t know how to calculate “income” for IRS purposes so we had a $6,000 tax bill one year. Ugh. Make as much as you can while still having a life and being happy; spend it on the experiences and food you really want. Love this series! Keep ’em coming! Agreed! I really like R29’s Money Diaries, if anyone is hooked on the concept and wants more (though there’s not as much context for the overall financial picture in those). Me too, completely hooked. Haha. Only thing that occasionally left a bad taste was that a lot of the comments to the Money Diarist were rather unkind or judgy about different lifestyles (though there are some that are more supportive). I have higher hopes for this online community though! This is super helpful, and can’t wait to read more! Oops. Completely hooked on the Money Diaries I meant. Reading comprehension and writing is not good today! I think these will be interesting reads. Curious as to whether their savings accounts are joint or separate? I noticed that the retirement account is the letter writer’s, and she does not contribute to rent. Would you mind elaborating on that a little, and why you chose that way? Did you notice if your cost of living in non-rent ways decreased when you moved to a lower COL area? Things like going out, gym memberships, groceries, etc? Thanks for sharing, and please ignore me if my questions are too intrusive! Not OP but I moved from a VHCOL area (Bay Area) to a VLCOL area (small town in the Midwest) and it was a bit of a surprise that basically nothing is significantly cheaper here except housing and restaurants, and some things are actually quite a bit more expensive (especially things like cleaning services, grocery delivery, fitness classes). And for restaurants I think it’s just that we don’t have any really high-end restaurants so you can’t make a direct comparison. Ethnic food is way more here (less competition, I guess). Groceries (especially organic groceries) are surprisingly cheap in the Bay Area, I guess because so much produce comes from California and there is lots of demand for organic stuff. Housing is 10x cheaper here though, so it’s easy to not sweat the small stuff. But it was a surprise. Do you pay for childcare? That’s another big one. I pay about $900 a month per kid for childcare in my LCOL, but my sister lives in a VHCOL and childcare there is like $2500 per kid. I do. Daycare here is definitely cheaper (although we have a lack of high quality daycares) but nannies aren’t. We have a nanny and it’s $40k/year, which is similar to what my bay area friends pay. I moved from a VHCOL area to the same area as the contributor, and except for housing and utilities, the cost of living didn’t change too much. Groceries are cheaper but not dramatically so. Going out and gym memberships are pretty much the same. The big difference is in rent and to a lesser extent, utilities. Transportation actually costs me more because I have a car instead of just using the subway. That being said, the difference in rent is more than the cost of a car payment. The real difference for me is time and stress–my commute is significantly shorter and, while I’m not sure I actually work less in terms of time, my work environment is far less stressful (and my salary actually went up when I moved). Great series! Thank you for contributing. If you’re open to it, I think adding a section of salary history would be helpful/interesting. 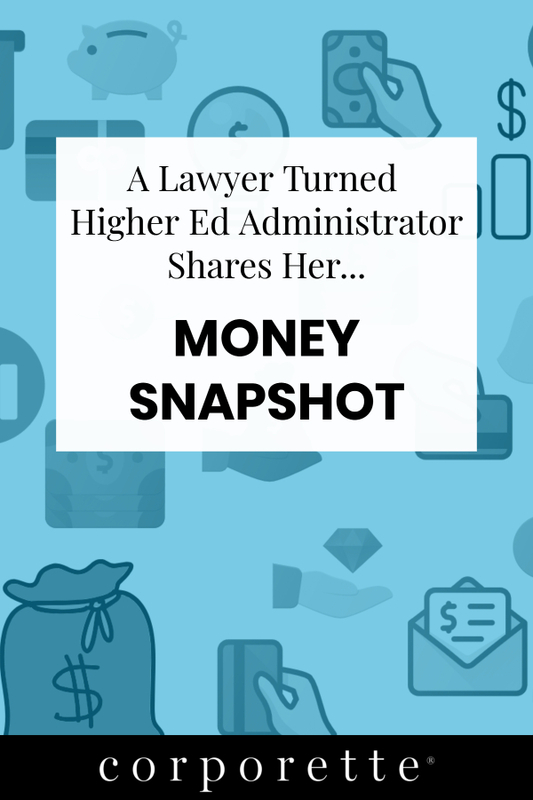 OP makes $83,000 now, but how much she made as lawyer also impacts how comfortable that $83,000 feels now. How do 2 car payments plus gas plus insurance fit into $350/month transit budget??! Poster from above in the same area–that makes sense to me. Regular gas near me right now is about $2.20/gallon, so significantly cheaper than, say, L.A.. Insurance is also cheaper here, and if you’ve got a cheaper car and don’t drive a ton, that seems completely reasonable. It’s not clear whether the subject included insurance in that number. Kudos to OP for accruing minimal student loans! Do you find it was a good decision overall? I understand that everyone has different circumstances/wants/priorities, and that there have been quite a few “don’t go to law school (unless)…” threads/posts here… would love to hear OP and others’ perspectives on this point! I never really comment on pieces here, but I wanted to say that I found this really helpful. There is a lot more detail than some other money diaries and it is really useful! FYI, the form only accepts #s on a few of the responses such as Vacations – Average cost of vacation and how often you take that ask for more detail than just a #. Curious how OP settled on 10-15% of income for annual savings for retirement. Did you use a retirement calculator? Thanks for sharing this. I noted you mentioned you accepted a full scholarship for law school but you could have attended a more competitive one. I’m wondering, other than no debt, do you think this was the right choice?